Where are you watching the Great American Eclipse of 2017? In Mark Twain’s A Connecticut Yankee in King Arthur’s Court, written in 1889, the author’s time-traveling protagonist finds himself in deep doo doo. After the Yankee travels through time and space, and after a few accidental misdeeds, King Arthur and Merlin decree that the strange “magician” should be executed—burned at the stake. But the Yankee has a trick up his sleeve. A history buff, the misplaced Connecticut Yankee conveniently knows that a total solar eclipse will occur on June 20, 528 A.D. in England at 12:03 p.m., the time of his execution. He uses this knowledge and threatens to “blot out the sun” with his “magical” powers if he’s harmed. At the last moment, just before the pyre is to be set ablaze, something quite astonishing happens in the sky overhead. The moon passes in front of the sun as promised, blotting it out, turning the land suddenly and inexplicably dark. Upon his release he promises to return the sun to the sky, which he does, and the hysterical crowd calms as the sun reappears. They conclude that this Yankee is clearly endowed with magical powers. Free to court the fair young maiden, our hero secretly credits science and the wonders of nature. Witnessing a total solar eclipse is said to create a cosmic connection for the viewer using a bit of real-life celestial wizardry that is not only the stuff of legend, but according to avid eclipse chasers, must not be missed. PHOTO: Lake Keowee in the upstate will be one of the first places in South Carolina where you can view the total eclipse. On August 21, 2017, a 70-mile-wide oval shadow of the moon will create the first total solar eclipse to cross the 48 states coast-to-coast in 99 years and will race to the Grand Strand. But there’s a catch. The eclipse’s shadow will first come ashore in Oregon at 10:16 a.m. PTD, then head southeast, eventually exiting near McClellanville, South Carolina, at 4:10 p.m. EDT. While Myrtle Beach and the northern Grand Strand will experience a partial eclipse, those seeking the real show must head an hour south and/or west of the city to witness a rare total eclipse, which offers a far more rewarding, astonishing and, yes, magical experience. Long considered omens of things to come, good and bad, both solar and lunar eclipses have frightened and mystified humanity from its earliest days. The ancient Chinese were certain that a large dragon was eating the sun, warning various emperors to behave. In 1223 B.C. in Mesopotamia, just after a solar eclipse scholars inscribed on a clay tablet “the sun was put to shame.” Even the crucifixion of Jesus and the biblical “darkened sky,” along with Muhammad’s birth, are linked to solar eclipses. Simply, a total solar eclipse is when the moon passes perfectly and completely between the Earth and the sun, leaving only a corona, or the sun’s outer atmosphere, behind it. As the Earth, sun and moon orbit each other, the moon’s shadow races across the face of the Earth in dramatic fashion. An annular eclipse occurs when the moon passes dead center in front of the sun, but due to its elliptical orbit is sometimes farther or closer to Earth, making it appear too small to fully cover the sun. A partial eclipse occurs when the moon obscures only a portion of the sun. Totality is what all the fuss is about and, according to a veteran eclipse chaser, “It’s the most spectacular thing you’ll ever see in your life, and getting close [to totality] is not close enough.” In other words, plan to travel to totality, which is less than an hour away from Myrtle Beach. Depending on your location, this totality can last for a few seconds up to a little more than 2 minutes and 30 seconds in South Carolina. The penumbral shadow (a partial eclipse) will be seen for thousands of miles north and south of totality. In fact, nearly everyone in the U.S. will experience some of the eclipse, but it will be unremarkable beyond the edges of the path of totality. The entire visible duration from partial, to total, then partial again, will last nearly three hours, but it’s the two and a half minutes in the middle that count. A lunar eclipse, which is more common, happens when the Earth passes between the sun and the moon, on average twice a year. While a solar eclipse happens somewhere on Earth every 18 months or so, to have one during midday when they’re the most dramatic, and in our neighborhood nonetheless, is exceedingly rare. In South Carolina, along the centermost point of totality, the partial eclipse will first be visible over the Upstate around 1:06 p.m., with totality beginning in Greenville at 2:38 p.m. and in Columbia at 2:41 p.m. The shadow will continue to travel southeast and totality will appear over Lake Moultrie at 2:44 p.m. before heading to McClellanville at 2:46 p.m., then out to sea. If you miss the eclipse at McClellanville, you’re out of luck unless you own a boat; it’s the last place on land to witness this extraordinary event. The eclipse’s ellipse-shaped shadow of totality is so enormous that despite its speed, totality is expected to last 2 minutes and 35 seconds. Grand Strand communities as far north as Pawleys Island are also in the path of totality, but only for around 40 seconds. Farther north of Pawleys Island and south of Charleston viewers will experience only a partial eclipse with no totality, and that’s a total bummer. But fear not! 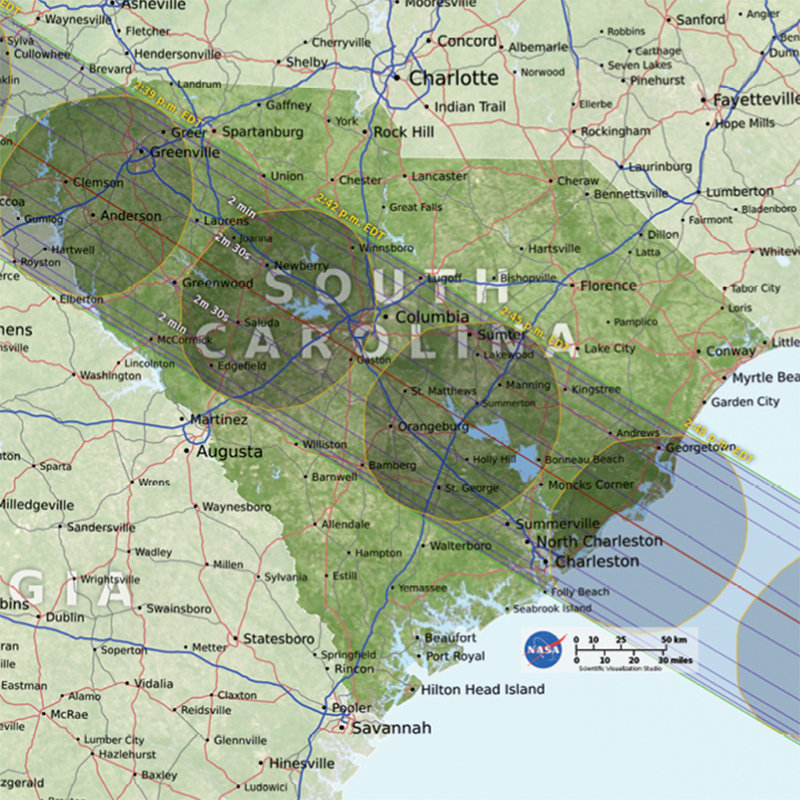 Major South Carolina cities within the path of totality include Columbia, Lexington, Georgetown and Greenville, all very near the centerline where huge crowds are expected and festivals are already scheduled. Lakes Moultrie and Marion are both in the path of totality as well. Charleston is also within the path of totality, but on the extreme southern edge where it will last around 90 seconds. Dubbed “The Great American Eclipse,” many millions of travelers are expected to be on the move to locations within the path of totality and major traffic jams are projected from South Carolina to Oregon. Traveling to see this once-in-a-lifetime celestial dance is worth the effort, but experts recommend leaving early and expecting traffic delays. Not needing much of an excuse to throw a party (or make a buck), many South Carolina locales and promoters will host eclipse parties. Columbia is taking advantage of its size and location, calling itself “The Total Solar Eclipse Capital of the East Coast.” As one of the largest cities in the U.S. along the centerline path of totality, Columbia has some bragging rights. Check www.totaleclipsecolumbiasc.com for a list of events in the Columbia area. PHOTO: Yonder Field in Bowman is planning an all-day festival on August 21. 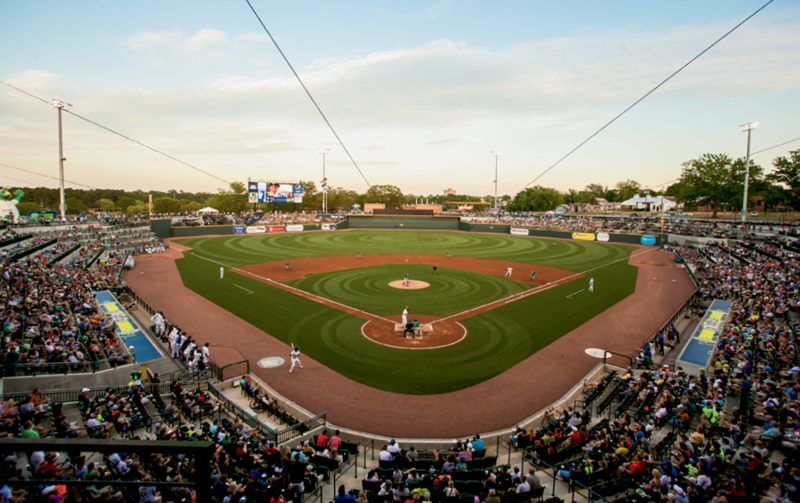 PHOTO: The Columbia Fireflies will play a day game on August 21. A list of statewide events can be found by going to www.nationaleclipse.com/events.html and selecting “South Carolina.” Here you’ll find information and links to Clemson University’s eclipse-related activities, the Anderson County Black-Out at Green Pond viewing party, the Eclipse Extravaganza at Roper Mountain Science Center (Greenville) and a viewing party at the Historic Columbia Speedway complete with live music and a drive-in movie (August 20–21) in Cayce. The Columbia Fireflies (minor league baseball team in Columbia) will host an afternoon game during the eclipse. Outfielders will not be able to blame the sun in their eyes for missing catches during the nearly three minutes of totality. While some events and festivals will take place outside of totality, don’t be fooled; all the experts recommend viewing within totality to fully enjoy this once-in-a-lifetime occurrence. Many South Carolina cities within totality are booking eclipse packages with rooms and roof-top viewing and even featuring on-site astronomers, but again the veteran chasers and experts also recommend staying flexible. If you’ve committed time and money in advance to a particular locale only to find clouds or rain rolling in, you’re stuck. If you stay adaptable you can adjust your travel plans early and drive to a sunny area to see the real show. With millions of additional eclipse chasers excepted to visit South Carolina during an already busy August, you may find the best and most rewarding eclipse viewing off the beaten path. It’s easy to choose your own destination by viewing any of the easily accessible online maps showing totality and the centerline. The most interactive and best map we’ve found comes by Googling “xjubier free” and clicking on “USA 2017 August 21 Total Solar Eclipse Interactive.” You’ll be able to zoom in and follow totality throughout South Carolina and all of North America. Leave plenty of time to find small towns and less busy roads to take you into totality with a lower likelihood of crowds and getting stuck in traffic. Need a few suggestions? The beautiful Congaree National Park near Columbia is within totality and will no doubt be busy, but will also offer lots of viewing opportunities and park visitation. Just make sure to go early and stay in the open and away from trees, which will block your view. Own a boat? Rent a boat? Throw your own party pontoon boat style on Lakes Moultrie, Marion, Murray, Greenwood, Keowee or on the Saluda River, all less than a day’s drive and all within totality. Really all you need are a pair of cheap solar filter glasses, sunblock, a few people with whom to share the experience, a picnic lunch, a good GPS, the Path of Totality Map and a spot with unimpeded views of the mid-afternoon western sky. Is the sun more dangerous during an eclipse? The short answer is no. The sun is equally dangerous all of the time because of its harmful infrared rays. During normal daylight hours the pain from the light (and our mother’s admonitions) keep us from staring at the sun. During an eclipse, the painful bright light may be gone, but not so the damaging infrared waves. So, as the eclipse begins and ends you must wear certified eclipse glasses or certified solar filters. These glasses and filters are hundreds of thousands of times more protective than even the best UVA sunglasses. Binoculars and telescopes must be fitted with their own solar filters. Even certified solar glasses worn over the eyes are not strong enough to protect you from magnified views of the sun. Inexpensive cardboard eclipse glasses are widely available online and presumably in stores just prior to August 21. Buy from a reputable dealer, as your eyesight will be in jeopardy if you don’t. Amazon.com sells a variety of eclipse-safe glasses. #14 welder’s glasses are also acceptable. While a partial eclipse is never safe to view with the naked eye, the good news is once totality has occurred (only possible within the path of totality) and the entire face of the sun is obscured by the moon, it is then (and only then) safe to view the phenomenon with the naked eye. For around 2 minutes and 35 jaw-dropping seconds, until the moon begins its trek away from the sun and the solar filters must be used again, viewers may watch the pageant in the sky without protection. Again, a partial eclipse must never be viewed with the naked eye, so get eclipse glasses or risk permanent eye damage or even blindness. While we’ll all hope for a sunny day in South Carolina, eclipse chasers won’t leave it to chance. They will drive or fly to places where the weather is expected to cooperate. A small group of the most dedicated hobbyists (with plenty of time and money) travel around the globe chasing eclipses because they say it’s an “emotional, spiritual, life-changing event.” These eclipse evangelists, not unlike Carly Simon’s vain man, will spare no expense to see totality. Because the eclipse will bisect the lower 48 states perfectly across the center, its location will afford easy access for millions of Americans and international tourists, who will travel here to witness the event. Plan ahead and have a happy and safe eclipse viewing!